We’re for a moment going to Pause the Process walked regarding the TIME-Personality, however – Christmas Day, and the whole Process involving Christmas – definitely do Stand within the context of/as the TIME-Personality. One can have a look at the relationship to TIME and one’s definition/experiences in relationship to TIME and one will find a variety of Sub-Personalities related to time within and as the Main TIME-Personality that we’re currently walking within this Blog. I would suggest consider Investing in the “Crucifixion of Jesus” Interview Series available on EQAFE – where, through the Portal, we’re walking the Process of Jesus’s Actual Process when he walked the Earth with human beings, his Actual Words, his Actual Living and what was the Real Words/Message his spoke, what was the Real Living Example he Expressed within and as the Real Meaning and Purpose for his existence/time on Earth – BEFORE his words, his living example was misconstrued, misinterpreted and misrepresented by/through those in Power and Control on Earth and in the Heavens to ensure eternal enslavement, instead of Eternal Freedom as Heaven on Earth; and so Earth came to remain separate from Heaven in/as a Master-Slave relationship, which can also be heard within the Interview Series “Journeys into the Afterlife” through the Portal regarding how/why humanity, through the Mind/Consciousness – was in fact controlled by Heaven within/as the enslavement of Energy. Back to Christmas Day – where all the mini-Christs Mass together on this One Day to “celebrate” various Religious doctrines; and this do not go only for Christmas, I mean; any “particular Day” that is “celebrated” within Religious, Spiritual, Movement contexts – has the exact same relationship regarding the World-System/Money. So, if anything, such Days as Christmas simply represent Human Being’s Ignorance, Acceptance and Allowance to/as what ‘life on earth’ is/has become in our accepted and allowed, ignorant/blind relationship to the World System/Money. And how this is veiled through/as Personality Systems in the Mind to which we’ve defined ‘who we are’ based on the knowledge and information and the energy-experiences within that, that would have us create/manifest Personality Systems – preoccupied with our “personalization” of the knowledge and information and energy experiences we had towards it, that produced the thinking patterns, backchat and behaviour and so would lead a Life unquestioned and simply FOLLOW the mini-Christ Masses without Questioning what’s Really going on in/as humanity/this Physical Existence. Because, I find it strange that – with having a look at Christmas, that God or Jesus would accept and allow a World System/Money System, for Only those With Money, to do the whole “Christmas Celebration” – BUYING presents, trees, foods, decorations, family gatherings…I mean, to REALLY Celebrate Christmas properly, and have it be a Celebration: One Need Money. 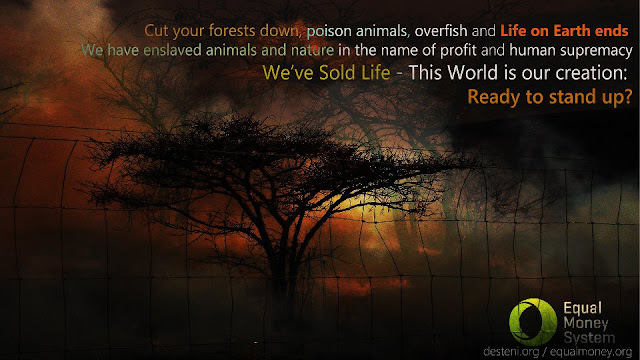 What they’re saying “thank you” to, is the fact that countless lives – human, animal, nature, earth – is forced into conditions of extinction, poverty, abuse, starvation, annihilation and destruction for/as them to have what they have. Because, if you research the World System of Money: “there is only so much money in Circulation”, so not all of humanity can “have money” and so; because the World System of Money control all the resources, and through the resources the Money – not all of humanity can have the “resources”. Therefore, the “thankfulness / gratefulness” is sorely misplaced to “God”…what they’re actually IN FEAR, RELIEVED about is the fact that they have Money and so have access to Resources. Thus, it’s not in fact REAL gratefulness, REAL thankfulness – it’s RELIEF from/of the constant, continuous Fear of Survival we exist in with competing to be the “Lucky One’s” that is part of the few/Minority within Humanity that have access to Money and so access to Resources, that is produced/provided by the Unfortunate/Unlucky one’s that couldn’t have a place/position/access into/as the World System of Money and so Resources so readily available, but instead have to be the ones that are at the bottom of the Hierarchy producing/ “dying for” the one’s at the Higher Levels of the Hierarchy – to create/manifest their products/material possessions FOR THEM. So, within this – how can it be Justified that, those that are at the lower-levels of the Hierarchy “don’t believe in God, are there by “Choice” / “their own Free Will” – or whichever Way it’s Justified in/through/by the Personality Systems of the Mind possessed within/as Religions, Spiritualities/Movements, when: with doing Research/Investigation into/as the World-System/Money-System that – there’s No Way, all of Humanity can have an Equal and One Life/Living in/on this earth with how Money and Resources, this entire Physical Existence is controlled to only cater to/for a Minority of Human Beings??? Their lives aren’t Determined by Religion, Spirituality, Movements or whatever justification, excuse/reason is given by such Human Beings – their Lives are determined because of how the Current Money System/World System operate/function/exist. Therefore, with Christmas - what Benefits, of course is: THE MONEY SYSTEM, and what accumulates/intensify/worsen on such a day, or during the process of Preparation for such a Day, is nature, the animal kingdom, the Earth, Human Lives and so their life/living conditions within/as the lower Hierarchies of/as the World System that produce/manifest the products/material possessions for the Elite to “celebrate their Christmas” and/or human beings which lose their life/living conditions/jobs because more Money is being filtered into and as the Elite that hoard all/most/percentages of the Money, leaving most human beings thus not having access to such Money/Resources. So, we suggest to Really have a look at what is in fact happening in REALITY, through our Living Actions within/on this Day of Christmas and/or Preparations for it – cause, it Really Does not In Fact Represent Anything Benevolent, Heavenly, Loving, Beautiful AT ALL. It in our Living Action – portray the exact opposite as the EVIL that is accepted and allowed for such a World System of Money to continue existing within humanity/this Physical Existence, while the Minority with Money go Pray and Celebrate Christmas in RELIEF from FEAR of being spared the horrendous conditions of the ‘unlucky/unfortunate ones’ who this Year didn’t make it in the Competition for Survival in the World System/Money; at the same time “Praying”, yet their Actions, Acceptances and Allowances – Speak a WHOLE other Story. Because in accepting/allowing Christmas and the Celebrations, what is Accepted and Allowed is the condition/state of countless human, animal, nature, earth lives/living that is experiencing Real, Physical Consequence in/as this Physical Existence for a Minority to “Have”. And so another Day Pass – close to the End of the Year, interestingly enough – where those Pray in Relief from Fear, actually Praying to the God of Money as the World System, for Winning in the competition of the Survival of the Fittest; and then comes the New Year – and the RACE starts again: who will make it in the World System/Money System THIS YEAR to again at the End of the Year being in a Position to “Pray” in Relief from being Spared the Fear of having Nothing/No-One/Nowhere to go because of not making it in/as the Competition through/within Money to be able to exist/survive within this World/Reality? Investigate the EQUAL MONEY SYSTEM – a System that is being walked to be implemented that will manifest/ensure each human being, from Birth to Death have an equal and one opportunity to/as Life and Living, Money and Resources distributed into/as equality and oneness. I mean, this is a REAL, PRACTICAL SOLUTION. Because there’s really something suspicious about “Praying” in apparent gratefulness and thankfulness for what one HAVE, when the processes of getting one what one HAVE is at the cost, expense and sacrifice of countless human, animal, nature, earth lives/living conditions; and not given by a “God”…but by/through the actual death, annihilation and extinction of other beings within/as this Physical Existence. In the Next posts, we’ll continue with the TIME-Personality and its Sub-Personality Systems.